SanDisk yesterday dealt its most capacious SD memory card yet: a 32GB SDHC that it expects to see on store shelves in April priced at $350 (£176/€235). SanDisk also showed off a 16GB version that'll come in at a more wallet-friendly $180 (£90/€121). 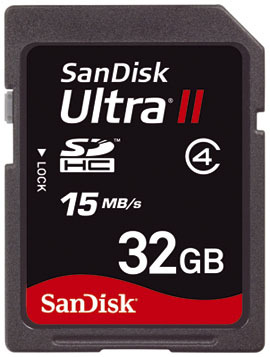 Both cards are part of the company's Ultra II range and offer a maximum read and write speed of 15MB/s, SanDisk claimed. They're rated as SDHC Class 4 cards. SanDisk's announcement follows last month's unveiling of a 32GB SDHC by Panasonic. However, Panasonic was unable to say when its card will come to market or how much it'll cost when it does. 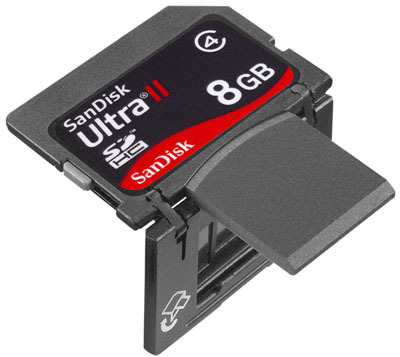 A third Ultra II card was announced yesterday: one of SanDisk's Plus cards - SDHCs that have a built-in, fold-out USB connector. This one has 8GB of raw storage capacity and is likewise rated at Class 4 - for a read speed of at least 4MB/s. Like the 16GB SDHC, the 8GB SDHC Plus will go on sale in March. It'll be priced at $100 (£50/€67).